Intravenous vitamin D is given to treat patients with kidney disease and to people undergoing kidney dialysis. Kidney disease interferes with calcium absorption, which leads to low blood levels of calcium. Giving vitamin D helps increase calcium absorption. Intravenous vitamin D medications such as calcitriol and paricalcitol can cause a number of side effects. Side effects of Zemplar, a commercial brand of paricalcitol, include nausea, which occurs in 13 percent of people receiving the drug; vomiting, which affects 8 percent, intestinal bleeding, which occurs in 50 percent; and dry mouth, which affects 3 percent, according to Drugs.com. Nausea and vomiting can be an early side effect of hypercalcemia, or high blood calcium, Quality Health reports. A metallic taste in the mouth, taste perversion and constipation have also been reported as side effects of vitamin D intravenous drugs. Severe stomach pain, loss of appetite and weight loss can also occur. 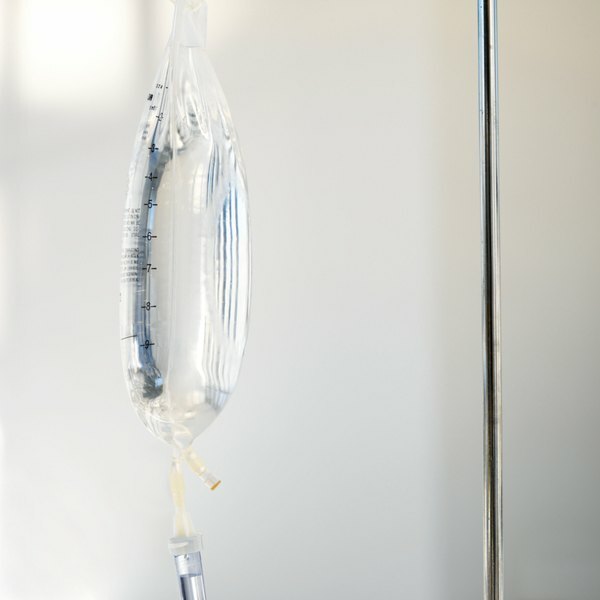 Intravenous vitamin D can cause edema, or fluid retention, in 7 percent of people, Drugs.com reports. Angioedema, fluid retention in the face -- especially around the eyes and lips -- can also occur. Rapid heartbeat called palpitations affect 3 percent. Irregular heartbeat, called arrhythmias, and high blood pressure can also occur. Side effects of intravenous injections of vitamin D include fever, chills, infection and flu, each reported in 5 percent of people. Three percent of people reported feeling unwell, according to Drugs.com. Weakness and sleepiness may occur as early signs of high blood calcium levels, according to Quality Health. Urine may turn foamy or cloudy after receiving intravenous vitamin D. Increased urination, urinating in the night and protein in the urine, called albuminuria, may also occur. Bone and muscle pain may occur when undergoing treatment with intravenous calcitriol. What Are the Treatments for Haemophilus Influenzae Pneumonia?